More than academics found in Spanish study program | Walk with us! Fr. 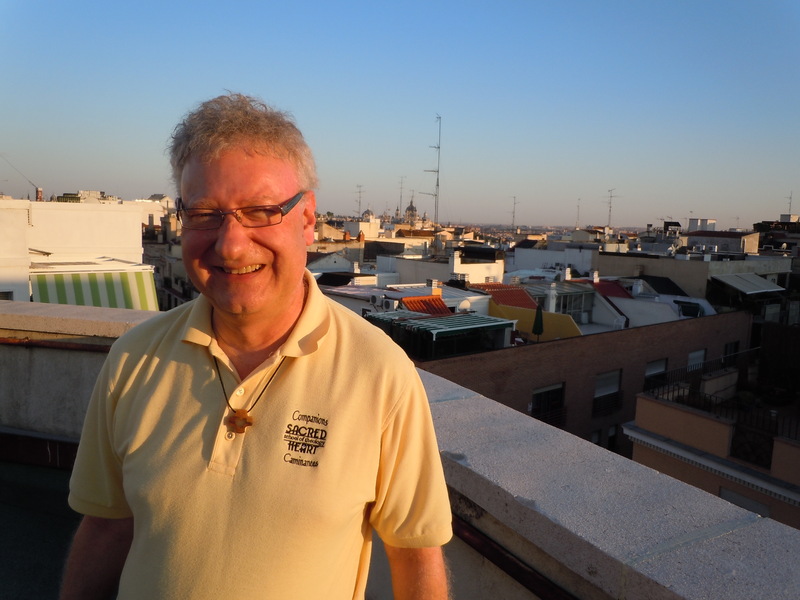 Jim Walters during his recent visit to Spain. For years I had hoped to study the works of Sts. John of the Cross and Teresa of Jesus. A year ago I became aware of a course offered through the Catholic University of Avila (UCAV), Spain. The course is taught in Spanish and offers study from the original texts. During my time in Avila, I chose to live with a community of Discalced Carmelites, three of whom were my instructors for the duration of the course. What I had anticipated as an academic experience proved to be much more. Our classroom sessions (Monday – Friday) were scheduled for three hours daily. We were encouraged to spend four to five hours of study and praying with the major works of both saints in preparation for each day. Saturdays were spent on visits to the historic sites relevant to the lives of John of the Cross and Teresa. These included: Salamanca, Fontiveros, Alba de Tormes, Segovia, and Toledo, in addition to frequent visits throughout the city of Avila to monasteries, convents, and hermitages. The challenge of working with 16th Century Spanish, at first seemed somewhat daunting, but an extensive research library was available with lexicons and contemporary Spanish translations and commentaries on the major works of both saints. Our liturgies together focused our study on how each of us is called to live the vocation to contemplative prayer in the midst of daily ministry. I was reminded often of Fr. Dehon’s hope that his sons would be contemplatives immersed in the struggles of the world. I came to appreciate the spirituality of John of the Cross and Teresa of Jesus as one that very much calls us to appreciate and affirm the beauty and dignity in all of humanity and to empty ourselves of all that keeps us from living in union with God and one another. The highlight of my time in Spain was a weekend pilgrimage to Santiago de Compostela. Although time constraints prevented me from walking the Camino, I was able to make the trip by train. I arrived at 7:00 AM and literally had the Cathedral to myself. I concelebrated the traditional Pilgrim Mass with an international gathering of priests and the archbishop of Santiago, Mon. Julián Barrio. Fortunately, I was able to witness the preparation and swinging of the “botafumeiro,” a four-foot thurible, used at special events including the novena of masses in preparation for the celebration of the feast day. Although I was not able to connect with many SCJs from the Spanish Province due to summer vacations and other commitments, I was able to spend a day with the community at Colegio Fray Luís de León in Madrid. They were very hospitable and gave me some great insights into our ministry in education throughout Spain.